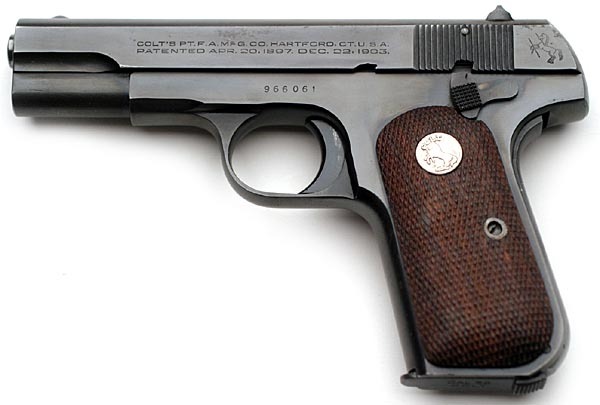 Colt Model 1903 Pocket Hammerless .32 ACP serial number 966061 - OSS / CIA issued military contract pistol outside the known and established serial number range. The highest recorded production number is 572215, with serial numbers 572216 through 572451 being manufactured but never assembled, being scrapped in 1945. Eight serial numbers numbers higher than the highest known number on this model have been observed. 831008, 831089, 831093, 831215, 831242, 831289, 831291, 966061 and 966071. Two of the pistols that are identified by John Brunner in his book on the Colt Pocket Hammerless Models (831093 and 831242). Five of the eight are known to have had their original serial numbers removed along with other government markings and were marked with a serial number that could not be traced to the U.S. Government. 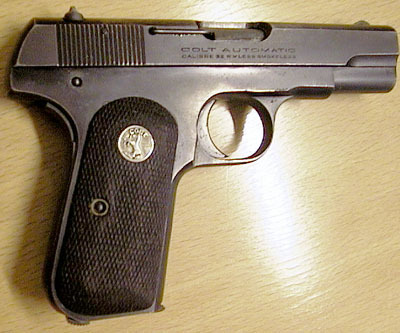 Colt Model M .32 serial number 966061 was issued to Lt. Col. Alexander Sogolow (also spelled Sogolov), a Russian born CIA agent stationed in Germany following WWII. 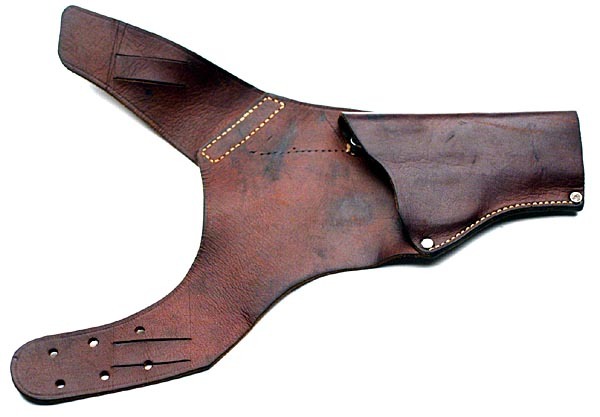 Accompanying the gun is a modified unmarked shoulder holster as well as documentation. 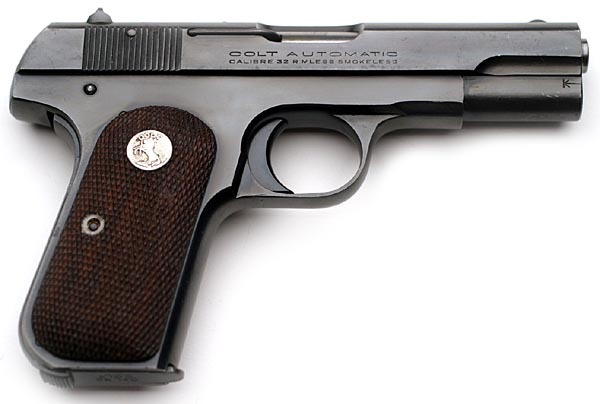 This pistol has all the military characteristics of a war time manufactured Model M .32 pistol. Right side of Colt 1903 Pocket Hammerless serial number 966061. Note lack of U.S. PROPERTY mark. Alexander Sogolow, 69, a retired Army lieutenant colonel and senior intelligence officer with the Central Intelligence Agency, died of respiratory failure Tuesday at the National Naval Medical Center. He lived in Chevy Chase. Col. Sogolow was a native of Kiev, Russia. He came to this country in 1926 and settled in New York City. He was a 1936 graduate of the City College of New York and attended St. John's University law school in Brooklyn. He served with the Army in Europe during World War II. He was an intelligence officer for the U.S. High Command in Berlin and a Russian and German interpreter for senior allied officers, including Generals Eisenhower and Patton. He left active duty in 1948 as a lieutenant colonel and joined the Army Reserves, from which he retired in 1972. Col. Sogolow joined the CIA in 1949 as an intelligence officer in Germany. During his years with the agency, he lived in Washington and Germany. Since 1963, he has lived in Washington and Chevy Chase. He retired in 1972. He was a member of the Association of Former Intelligence Officers, the Central Intelligence Retired Association, the Retired Officers Association and the American Association of Retired Persons. He was a volunteer for the American Red Cross. Survivors include his wife, Phyllis, of Chevy Chase; a daughter, Terry, of Silver Spring; a son, Robert, of Van Nuys, Calif., and a sister, Tamara Weinschenker of New York City. The family suggests that expressions of sympathy be in the form of contributions to the American Heart Fund or to the American Cancer Society. Close up of serial number 966061. 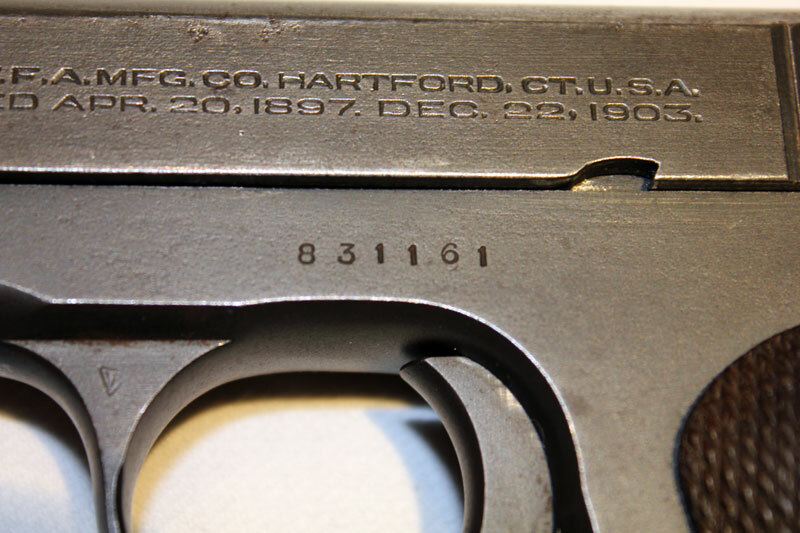 Style is different that that of serial numbers applied at Colt. There is no ordnance mark present behind the thumb safety. 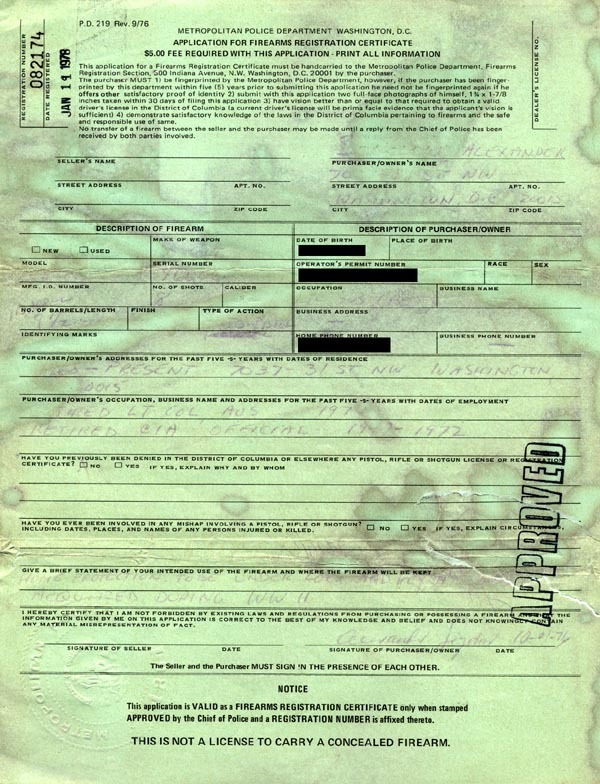 Alexander Sogolow's Gun Registration Application for Colt Model 1903 Pocket Hammerless .32 966061 dated December 30, 1968. 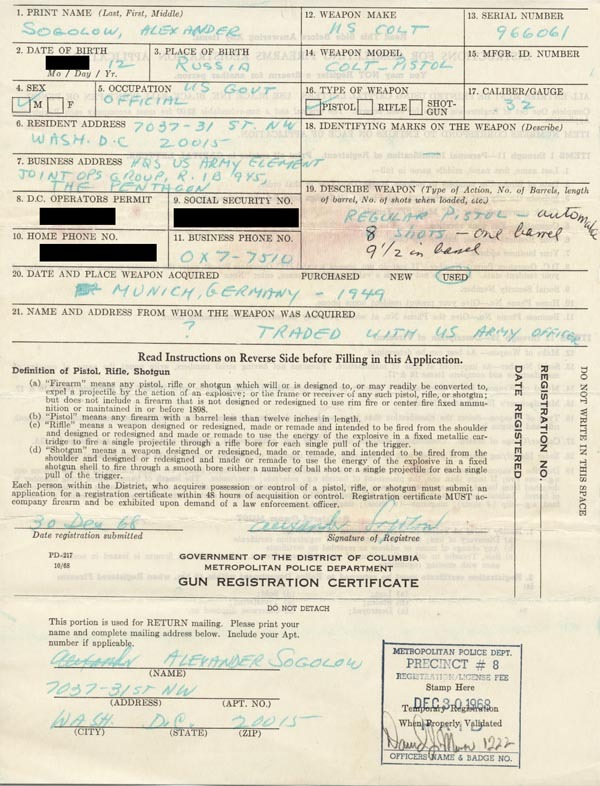 Alexander Sogolow's Gun Registration Application for Colt Model 1903 Pocket Hammerless .32 966061 dated October 21, 1976, but not approved until January 19, 1978. "There were others, many others. One of those placed under the counterintelligence microscope was Alexander Sogolow, a large and boisterous Russian-born case officer from Kiev who had the misfortune to be known throughout the agency by the name Sasha. It was Sogolow whom Peter Karlow had been thinking of when the polygraph operator asked him about "Sasha," making the needle jump and putting Karlow deeper into the quagmire. In Russia, many names have diminutives, affectionate nicknames that friends and family use in place of the more formal given name. For Alexander, the diminutive is always Sasha. Assigned to headquarters in the early 1960s after a tour in Germany, Sogolow got wind of the fact that the mole hunters in Langley were looking for "Sasha." On a trip to Vienna, he unburdened himself to Kovich, who was then serving in the Vienna station. "They're going to come after me," Sogolow bemoaned. "I'm in trouble. They say his name is Sasha." "Hell," Kovich assured him, "relax. There are eighteen million Sashas in the Soviet Union." Ironically, it was the first that Kovich had heard about the search for penetrations back at headquarters. He didn't know that he himself was a suspect. The Sogolows immigrated to New York in 1926, where Sasha graduated from City College and St. John's University Law School. It was the Depression, and Sogolow, according to a CIA colleague, "worked for a while selling chicken-plucking machines, until he was beaten up by a bunch of manual chicken-pluckers." During World War II, he was an Army intelligence officer, acting as an interpreter for General Eisenhower and General Patton, and then working for the High Command in Berlin. Rejoined the CIA in 1949 and was sent to Germany. Since the Soviet Union was the main target of the CIA, the agency needed Russian-speakers. Like Sogolow, many officers in the Soviet division inevitably had Russian backgrounds, which to the mole hunters made them all the more suspect. And Sogolow, despite Kovich's ironic reassurances, was under suspicion by the SIG. He had a Slavic background and had served in Berlin. It was true that his name did not begin with the letter K, but by now, the CI Staff was not wedded to that detail of the mole profile. The search for penetrations had begun to spread to other letters of the alphabet. Worst of all for Sogolow, his name was Sasha. On the face of it, it seemed unlikely that the KGB would use the code name Sasha for someone who really was called Sasha. But it was not impossible, and in the atmosphere of the time, the CI Staff was leaving nothing to chance. As for Sogolow, Miler said, "nothing was found." He was not transferred to a lesser job, Miler insisted, nor placed in the limbo that awaited other targets of the mole hunters in the D corridor. But Sogolow was never to reach the level he had hoped for within the agency." It made a nice story, but it seemed improbable that the jewels would have been entrusted to a five-year-old. Within the Sogolow family, the accepted version was that the jewels had been smuggled out of Russia in the heel of the shoe worn by Sasha's older sister. David Chavchavadze, Crowns and Trenchcoats: A Russian Prince in the CIA (New York: Atlantic International Publications, 1990), p. 154. 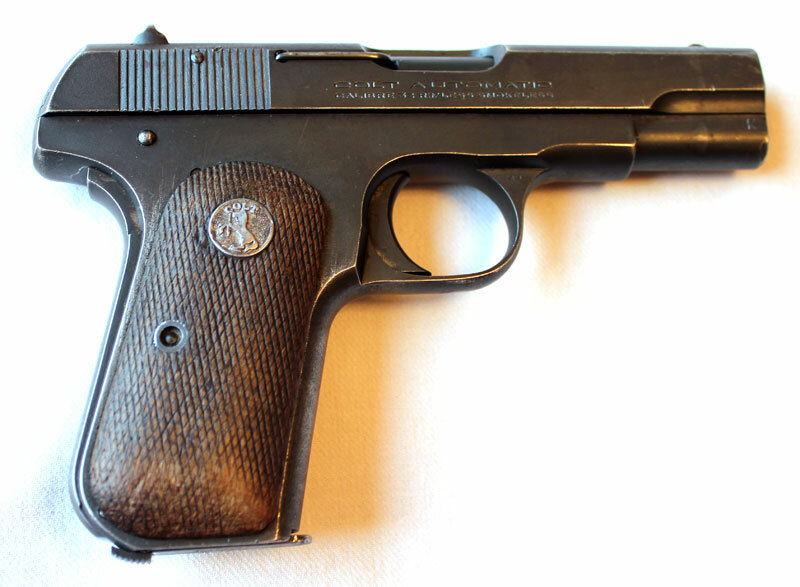 Colt Model M .32 serial number 966071 - This is a very unusual Model M with late Type V features (notice slide serrations and rear sight) that bears a serial number outside of the normal range for this model. Serial number 966071 was used somewhere in Central America area as a German firearms dealer who resold it indicated this was the source of the pistol. 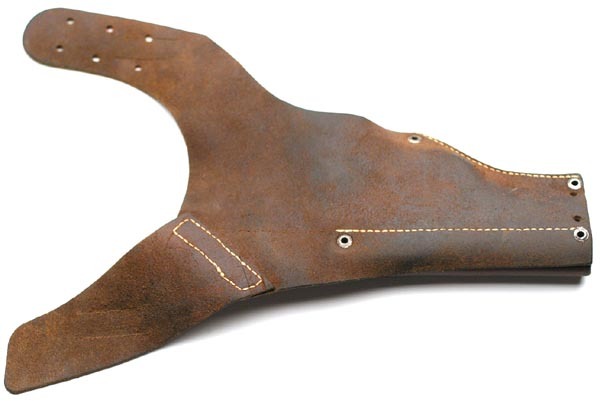 Frame is definitely Colt and bears the "VP" verified proof mark on the upper left flat of the trigger guard. Other examples of these pistols in the 800,000 serial number range have been identified as CIA weapons cache guns. Close up of the serial number 966071. 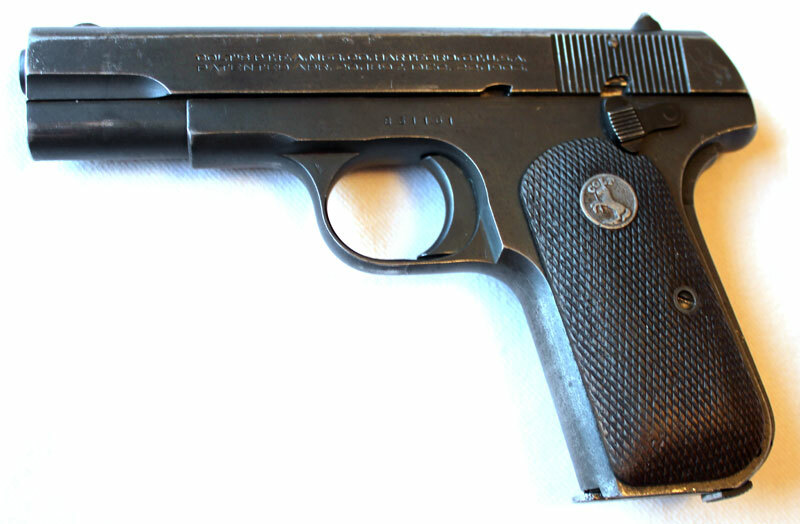 Colt Model 1903 Pocket Hammerless .32 serial number 831161 - This is another unusual Model M with late Type V features (notice slide serrations and rear sight) that bears a serial number outside of the normal range for this model and is the earliest serial number that has been observed. It is believed that Colt Model 1903 Pocket Hammerless .32 ACP pistols numbered in the 831000 range were used as weapons cache guns in Asia. Frame is definitely Colt and bears the "VP" verified proof mark on the upper left flat of the trigger guard. Finish appears to be parkerized. 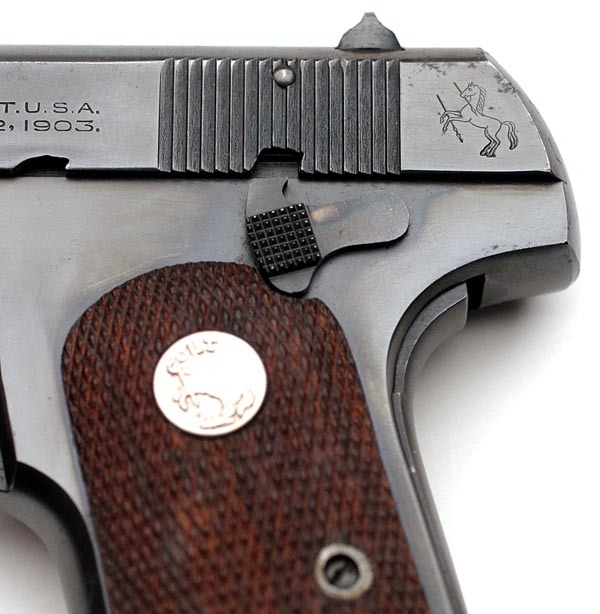 Colt Model 1903 Pocket Hammerless .32 serial number 831161 - Close-up of serial number. Notice how this number is not in the style typically seen on this model Colt. 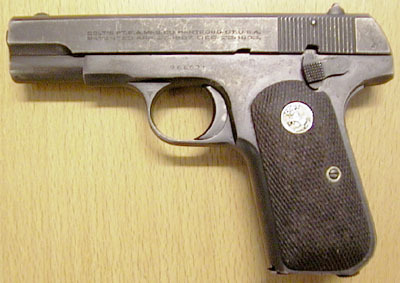 Colt Model 1903 Pocket Hammerless .32 serial number 831161 - Right side view. Notice how there is no US PROPERTY mark on the frame.